KBR is delighted to welcome author Tristan Bancks with this fabulous post on collaborative writing with schools. 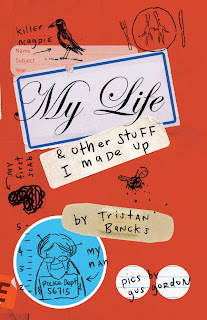 My Life and Other Stuff I Made Up is a book of short stories that I wrote not only for kids but with them. Now, more than ever, children’s authors have an opportunity to invite readers into the process and blur the line between creator and audience. I often use my workshop, festival and Skype sessions as a chance to brainstorm stories with kids. I would then take a photo of our whiteboard brainstorms and work the best of the group-generated ideas into the story, acknowledging the school at the end of the book. Of course, working in this way brings up some ethical issues around using group ideas for a book that only the author will be paid for. I asked many librarians, teachers, kids and even a lawyer-friend about this and the general consensus was, ‘Go for it.’ I ultimately felt that if I created the original idea and then acknowledged the group in the book for their contribution I could feel good about it, giving kids a sense of ownership over the stories. The collaboration did not stop there. Once the story was written, I would read it aloud to groups and get feedback before sending it to the publisher. It is slightly scary to read unpublished work to an audience but an amazing way to hone comedy. The Dog Kisser (recently recorded as a free audio story) evolved over a period of months using this read-aloud approach. Coming from a TV and film background, I love this approach. I plan to continue to work collaboratively, always acknowledging contributors and blurring the creator/consumer line in ever-more-interesting ways. Learn more about Tristan and his work at www.tristanbancks.com. Good for you, Tristan! At least the kids are involved in story-telling and unfortunately, even though this should happen every day at school, teachers don't have the time or the confidence to do it!